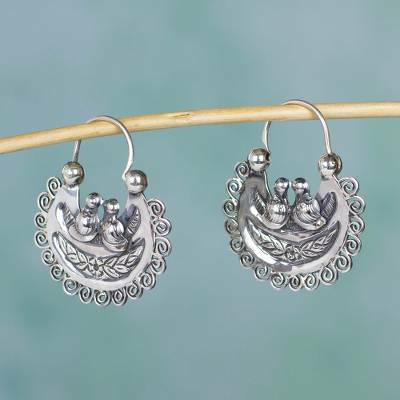 Artisan Crafted Silver Mazahua Style Sterling Hoop Earrings, "Mazahua Lovebirds"
In Mexico's Mazahua community, birds are often a symbol of beauty. Mazahua Family artisans depict lovebirds in these handcrafted hoop earrings. They perch in a sterling silver nest surrounded with diminutive spirals. Most Mazahua women wear earrings in the shape of a half moon, as these are gifts from the husband in lieu of an engagement ring. "My favorite pair of earrings"
Great earrings, very pretty and well made.